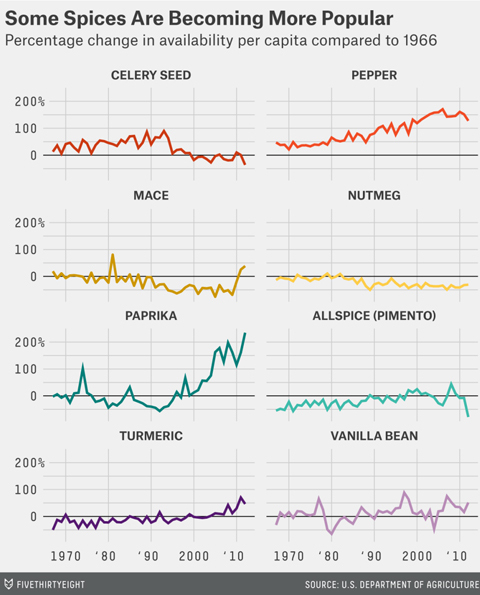 FiveThirtyEight highlights the spices that have become increasingly popular, and those that have been pushed to the back of the cupboard. Do you give much thought to the spices you sprinkle on your baked chicken—or do you just grab what’s in your pantry and go for it? Which spices you use, and which spices you have on hand, says a lot about current food trends. Rising domestic use of spices reflects growing Hispanic and Asian populations, a trend toward the use of spices to compensate for less salt and lower fat levels in foods, and heightened popularity of ethnic foods from Asia and Latin America. 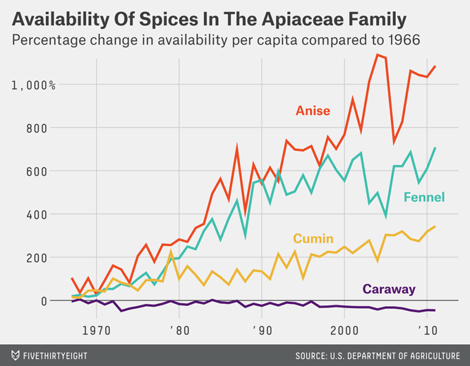 The FiveThirtyEight blog took the USDA’s extensive spice data—which details the availability of various spices every year from 1966 to 2012—and created helpful graphs to show which spices have become more popular, and which have been pushed to the back of the spice cupboard. From 2004 to 2011, the per capita availability of turmeric jumped nearly 70 percent. It seems like more and more studies touting the spice’s health benefits come out every day. “Sometimes you have to give the credit to the medical people,” owner of The Spice House, Patty Erd, tells FiveThirtyEight. Ginger availability has shot up nearly 525 percent since 1990. Like turmeric, ginger is also known for its health benefits, including reducing inflammation, preventing colon cancer, and strengthening immunity. Over the past 50 years, anise, fennel and cumin have seen 1,000, 700, and 375 percent increases in per capita availability, respectively. Caraway has seen a 50 percent decrease. Is rye bread becoming unpopular? Want to learn more about spice trends? Spice giant McCormick does an annual spice forecast. 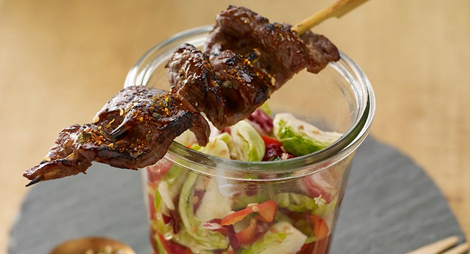 According to the 2015 report, global spice blends—like shawarma spices and Japanese 7 spice blend—are on the rise, as are smoked spices and sour salt blends. We wonder what the snobby elite of medieval Europe, who viewed spices as low class, would think of all this.